Our Etsy shop this week is filled to the brim with absolutely adorable handmade creations. Parami Panda Crochet, owned and operated by Alix and Winston from Alameda, CA, use their love of crochet to create little creatures ranging from a bee to a green monster. They have so many characters that you are sure to fall for, but if you don't see exactly what you are looking for feel free to contact them about a custom order. 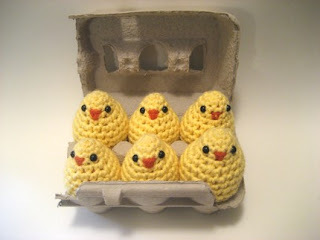 I was so glad to do the feature with Parami Panda Crochet before Easter because I thought these little chicks would be a big hit! Containing 6 chicks, each about 1.5" tall, they come packaged in the carton that they just hatched from. Standing at 5" Igor may be petite, but he is certainly not short on personality. Just look at those big eyes! He is made with soft acrylic and has hand-sewn felt feet. For all the regulars you already know the drill. For the newbies, welcome and here is the rundown. 1. Check out Parami Panda Crochet's shop. Come back here and comment on your favorite item in the shop. Entries will be accepted through midnight Saturday. Check back Sunday to see if you are the weekly winner. oh my god, those chicks are so so so cute! 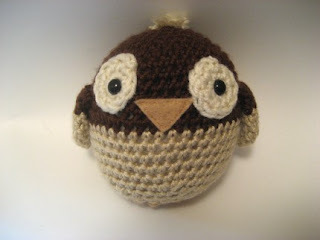 I love the tiny crochet chicks! cutemess! Aww that bunny is so cutie petutie! Those little chicks remind me of peeps. I am following your pretty blog. Everything is so cute in Parami's shop. The Pink I'm Sorry/I Love You Bear with Flower is too sweet. 1. i like the baby cream easter bunny . also is this giveaway open to everyone worldwide ? I am now a follower of your blog . Duh, those chicks are obviously the cutest!! But, if I had to pick something not already featured... Walter the fuzzy sheep is pretty darn cute too. va-to answer your question, yes it is open to everyone worldwide. There is nothing cuter than that octopus! I guess the bees have it! momma and baby are so cute. I think that Godric the Vampire Bunny is adorable! I am a new and happy blog follower! my fave is Igor the owl! so cute! ps. come and check out my giveaway too! So cute! I'm a blog follower now. Mt favorite is the Baby Winter Bunny. Adorable! Oh! They're all so cute but my favorite one is the pink and white heart octopus. Adorable! Thanks for the chance, I'm following. If I win, contact me on my blog please! Thanks!! THE BABY WINTER BUNNY. It kills me with its cute factor. 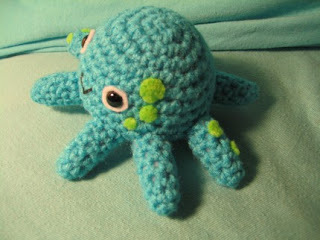 The blue octopus is cute too! I'm a new follower. It might make a difference to say I came here from etsy's forums. I like chicks a lot seeing that I have four baby chicks in my bathroom right now ready to grow big and join my backyard flock.